Stride by Stride: Mucho Macho Man MANIA, Deservedly So!!! It doesn’t take a stampede of friends for this horse to take the world by storm. MUCHO MACHO MAN! I love this guy. And not just because his fabulous stride and big heart won him and jockey Gary Stevens, trainer Kathy Ritvo and Reeves Thoroughbred Racing, the Breeders’ Cup Classic at the 2013 Breeders’ Cup. Mucho Macho Man, a gorgeous, delicious, caramel-candy colored six-year old, stud among even other stallions, hails from Florida and certainly deserves serious consideration as the 2013 Eclipse Award’s “Horse of The Year.” Yes, he had fierce competition at the Breeders’ Cup Classic wire, but if you keep your eye on his nose at the line, there’s no doubt he kicked his courage into overdrive to get the job done. Watch the race and amazing finish here: Go, Mucho, Go! Gary Stevens definitely deserves accolades, as well, for riding Mucho across the finish with an adventurous spirit, robust heart and gentle hand. But as any true horse lover will attest, it was Mucho who made that win happen. He didn’t cave under last-minute pressure from strong contender Will Take Charge. He didn’t relent his focus or soften his assertive winner-take-all attitude when pressed to push for more in the final stretch. That’s a long race, one and a quarter miles. I know I would totally epic fail if asked to move at 35mph for ANY reason or distance. January 2014, Mucho enjoyed public accolades while receiving the 2013 “Secretariat Vox Populi” award. He’s a horse with heart and courage as substantial as his seventeen hands. Purse earnings. Over five million to date. Lesser horses might be content to run the race of his life in a single Breeders’ Cup series and then take it easy. Not the fabulous Mucho Macho Man! He and superhero trainer Kathy Ritvo, who herself, has battled significant health issues (we’re talking heart transplant surgery size problems) also ran and came in a close second in the 2012 Breeders’ Cup Classic race. Gulfstream Park, in Florida, will honor Kathy during pre-Eclipse Award events on Thursday, January 16, 2014. If I could go, I would. Hello! You had me at mani-pedi Gulfstream Park. Mucho Macho Man is a horse that keeps on giving. He’s beautiful to look at, exciting to watch run (AND WIN!) and fun to dream about being fortunate enough to care for in his twilight years. Step to the side, ladies, that line starts behind me! 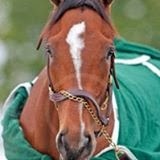 If you’ve been living in a dark cave, or for some other heinous reason, have been cruelly deprived of knowing the joy that is MUCHO MACHO MAN tearing up racetracks across the country, fear not, it has been officially announced that he is competing in 2014. First stop, the Sunshine Millions Classic at Gulfstream Park on January 18th.